We bring forth an outstanding range of Bullet Chain Saw to our respected patrons that is manufactured by making use of qualitative raw material that is procured from authentic vendors of the market. This range is appreciated for applications in numerous industries and sectors for various purposes. Quality analysts at our end make sure to fabricate this range by following quality standards and guidelines in sync with the industry set norms. Patrons can avail this range at market leading prices. 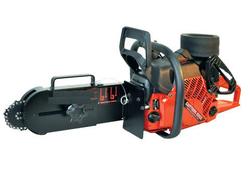 We bring forth a highly regarded range of Diamond Chain Saw to our esteemed patrons. Offered range is widely used for several applications in diverse industries and sectors. This range is accredited for its built as per industry set norms and guidelines. Our offered range is therefore, fabricated using advanced techniques and strategies and can be availed in diverse customized range as per the need of customers.